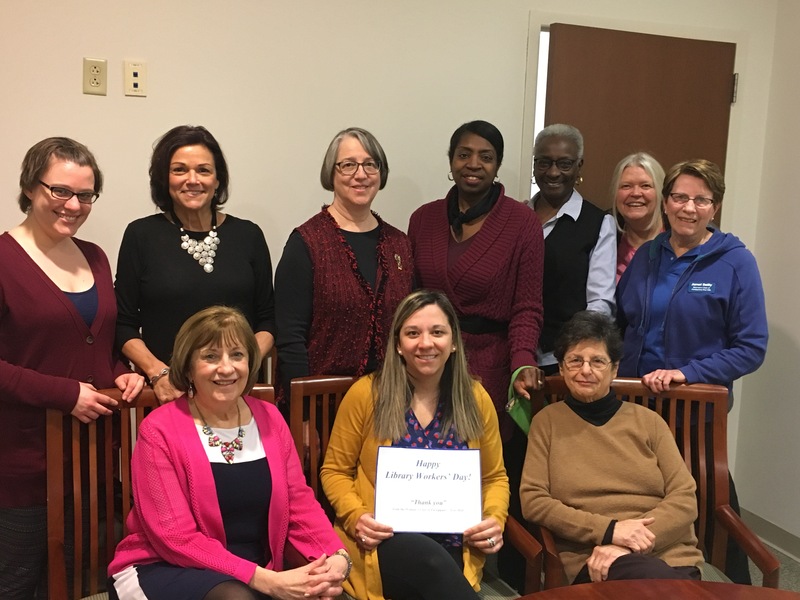 Librarians and Staff Members at Parsippany’s three libraries; Main Library, Mount Tabor Branch and Lake Hiawatha Branch were treated to refreshments on this month by members of the Woman’s Club of Parsippany-Troy Hills (WCPTH) to celebrate National Library Workers’ Day. Club members treated the staff at all three branches to desserts, chips, fruit and drinks to thank them for their dedication to the Parsippany library system. Club Members were on hand to chat with the staff and thank them in-person. This is the fourth year WCPTH has supported National Library Workers’ Day. The club has a special relationship with the library, being one of its first donors in the 1960’s when the township library was established. Nationally, Women’s Clubs are credited with establishing three quarters of the nation’s libraries. Back row L to R – Library Staff members – Gina McCrostie, Maria Crawford, Janet Porsche, Martha Martinez, Vera Borum and WCPTH club members Joan Garbarino and Janet Reilly.